One thing often leads to another. In a recent example, revisiting my Korg Electribe S Mark II sampling drum machine was the trigger for a new Max For Live project. The 'doppler flutter' effect (for want of a better name) is a perfect example of using two controls at once to achieve a single effect, and it requires one control to be increased whilst the other is decreased, and vice-versa. Doing this in Max For Live took me longer than I expected because I quickly realised that when I moved the controls, I was not doing simple linear rotations with abrupt stops, nor was I doing the eased sine movements that I have been using for almost all of my LFO-driven effects so far. No, I was listening to the resulting sound and modifying the control knob movement in response, and so it seemed like the rate of change of rotation was a major contributor to the final sound. A bit of experimentation quickly showed that this was the case, and so I re-used the power-law sine shaper from the Wavetable Creator to give me a variable shape of LFO control pulse for the two oppositely driven controls. The results are very interesting. The 'Shape' control provides very detailed control over the shape of the LFO control pulse that peaks the delay depth/feedback and dips the delay time, and yet minor changes to the way that the controls change can have very marked effects on the resulting rhyhmic patterns. When I analysed this a bit deeper, then it became obvious that having the controls inside the delay feedback loop was going to affect the sound considerably. To emulate the 'riding' of a human being tweaking controls, I added a conventional 'Swing' timing control, and this works very nicely with the 'Shape' control. Separate depth controls for the feedback delay time and the left and right inputs provided very strong delay-based stereo imaging as a bonus. And so Dopplator was born. In sync mode, a simple bassline or drum pattern can be glitched very nicely with a wide variety of rhythmic echo-based additions, whilst in the free-run mode then the arthythmic variations can be long and complex. All from a very small number of controls... The process of exploring the options has resulted in an effect which has moved on considerably from the source of the inspiration, so this is different to the 'doppler flutter' effect in my Electribe S, but it is an interesting addition to the genre! 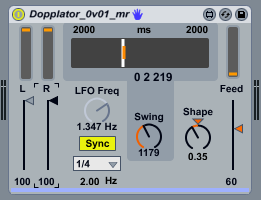 As always, Dopplator is available from the maxforlive.com website. Enjoy! Korg iElectribe Gets "Beat Flutter"